Link and Zelda head to the Picori festival, a celebration of the tiny people named the Picori who appear every 100 years. A mysterious swordsman named Vaati wins the swordfighting contest, but reveals himself to be an evil sorcerer, turning Zelda to stone and unleashing monsters upon Hyrule in his search for the Golden Power. 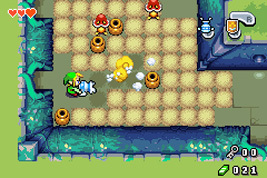 Link meets a strange creature named Ezlo who has been transformed into a green cap who leads Link into the miniscule world of the Picori. 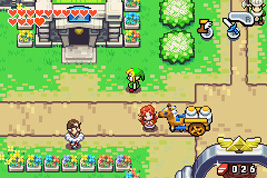 Now Link must travel Hyrule and the world of the Picori as he searches for the elements that will add power to the Picori Blade, allowing Link to split into multiple Links and face Vaati. 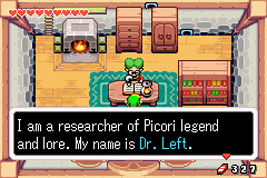 In the game you meet a strange professor who hides in his house reading books all day. Dr. Left is based on Dr. Wright, the mayor's assistant from the Sim City series. 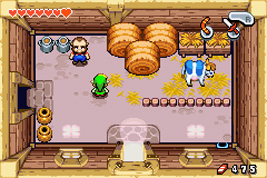 Talon the farmer is based on the same character from The Legend of Zelda: Ocarina of Time, who in turn was based on Mario. Gorman the real-estate entrepeneur is based on the character Ingo from The Legend of Zelda: Ocarina of Time, who in turn was based on Luigi from the Mario series. A walking bomb that lights its fuse when hit with a sword. Bob-omb is originally from Dream Factory: Dokidoki Panic and the Mario series. 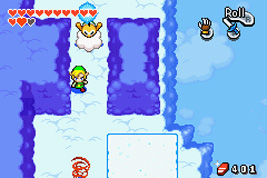 The bespectacled, cloud-riding turtle from the Mario series appears, throwing lightning bolts at Link.